We have today launched a new range of 10Gb/s Un-Metered bandwidth dedicated server services hosted from the London Docklands. Following from recent network expansions our 10Gb/s un-metered servers represent the best value high bandwidth dedicated servers in the UK. Our 10Gb/s range of servers are hosted at either the Telehouse campus or Sovereign House datacentres in the London docklands providing the lowest latency to UK and European locations. 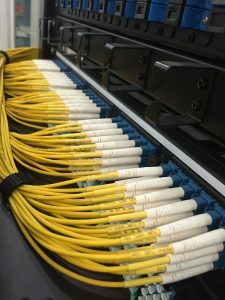 The launch of our 10Gb/s range of servers follows recent network expansion into Digital Reality Trust’s Sovereign House datacentre and a 300% increase in our upstream connectivity, with additional connectivity being added to our existing carriers NTT, Level 3 (CenturyLink), new connectivity from Cogent and additional peering ports on the LINX and LONAP internet exchanges. Our 10Gb/s un-metered servers start at just £995/Month + VAT, a saving of over £400/Month over our nearest competitor, whilst 10Gb/s servers with 100TB monthly data transfer are available from just £395/Month. Our 10Gb/s servers utilise enterprise grade Supermicro hardware found across all of our dedicated server offerings and come with our standard 24/7/365 freephone telephone support and guaranteed ten minute response time to critical support helpdesk tickets. If you have any questions about our 10Gb/s servers then please get in touch with us or you can find more information on our website here.